Note: Against any of this guide's bosses (except Ganon's final form), a single Ancient Arrow in the head is enough to deal massive damage. Furthermore, you can also use Urbosa's Fury if you've unlocked it, to stun the boss and put it down for a short time. Description: Here is the Zoras' dungeon boss. Be brave, you have to avenge Mipha! It's a huge warrior created by Ganon, with a slim and slender appearance. It's huge and easily several times taller than any of your horses. It's wearing a mask with a single eye in the middle and is wielding a gigantic spear that can wreak havoc. Its attacks: During a first phase, it only has four attacks. It can attack you by throwing its weapon at you, which is rather easy to dodge. It can also sweep away the whole ground in front of it with a huge spear blow, in front as well as backside. It can also hit you with a little swifter thrust. Finally, if you stay too long next to it, it can thrust its spear into the ground to send you away, but it deals very little damage. After transforming the room by flooding it, it will throw ice blocks at you and will still be able to throw its weapon at you. It may also hit you with its spear if you step too close to it. Be careful, when you'll have it with its back against the wall, it may fire at you with the Guardian's laser beams thanks to its eye! 1st phase: It's rather easy to move in this room, so make good use of the space. Start by noticing its attacks' timing to dodge them more easily. You can choose to put it down by shooting arrows at its eye or to fight it with a close combat weapon. If you choose this, you'll have to handle your dodges and/or your parries well. Parries work against any of its attacks. For dodging, perform a backflip when it sweeps and a sidejump against its throw or its thrust, still with the required timing to perform a counterattack straight after this. Keep doing arrow shots or counterattacks to put it down for a moment and mash Y as soon as it's on the ground. Once its life bar is down to its half, the second phase begins. 2nd phase: Things are starting to get harder. After it's flooded the room, the boss will stand above one of the platforms and throw ice blocks at you. Use the Cryonis Rune to destroy them. Once it's thrown all its blocks, Waterblight will stand still two seconds above its platform, that's the ideal shooting moment! Shoot an arrow at it to make it fall down then swim to it and hit it (preferably with a spear) from the nearest platform. Repeat this a few times to corner it. It will then fire Guardian laser beams at you. You can shoot an arrow at its eye to stop it or try to shield-repel its own beams at it to deal some massive damage, if you're braver. Tip: When the boss is throwing its ice blocks at you, try to stand with one platform between the two of you (meaning: certainly not in the opposite corner as it is) to be able to swim at it as fast as you can and thus have more time to then spear it. 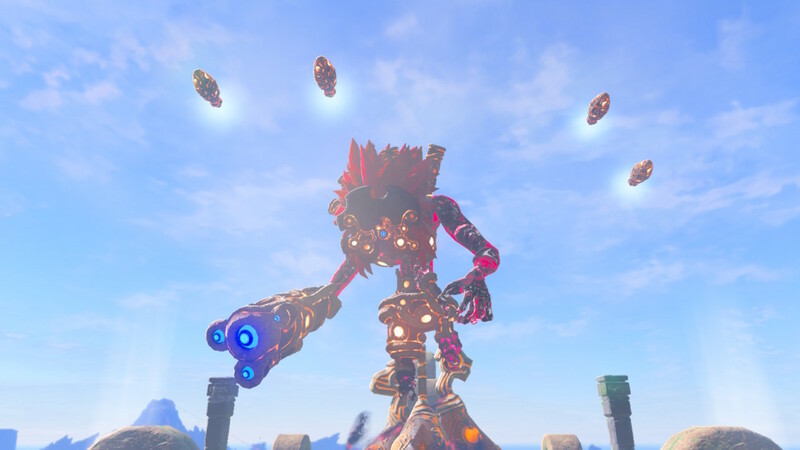 Description: So here is Fireblight Ganon, Daruk's murderer and source of the Scourge haunting the Divine Beast Vah Rudania. It's once again a gigantic warrior, but this time with a stronger build, still wearing a mask with a single eye. It's wielding a gigantic sword in its right hand and is able to cast magic from its left hand. 1st phase: You can choose to fight with perfect dodges and parries, followed by counterattacks. Notice the timing of its sword attacks and parry or dodge, a backflip against its lateral blow or a sidejump against its side blow. When it's casting fire at you, stick to dodging it. You can also choose to attack with the bow, so have fun with Ice Arrows, which will be more efficient. When you've attacked it enough, it is dizzy for a while so take advantage of this to mash the Y button. After 50% of dealt damage, the second phase begins. 2nd phase: Now things get serious. The Fireblight will put its sword on fire then fly away and inhale the surrounding warm air to generate huge fireballs, very slow, but with an unseen range and destruction power. Unfortunately, it generates a barrier to protect itself from your arrows while it's preparing its attack. The answer lies once again in the Sheikah Slate. While it's generating a fireball, throw a bomb at it and make it explode after it has swallowed it. It will then fall, so rush to hit it in close combat. Then, it will alter between sword attacks like during the first phase, and various fire spells. If it tries to cast its deadly fireball at you again, it won't protect anymore, so stop it with your arrows or repel its fireball thanks to the shield. So stick to dodging, counterattacking and shooting a few Ice Arrows at its eye, and you should see it through without too much problems. Its attacks: This boss isn't keen on variety. It has only three attacks. It can either fire laser projectiles at you with its cannon, or send tornadoes at you. However, these two attacks get upgraded for the second phase, and it will then have a third one at its disposal, so be careful! To defeat it: Before the fight, be sure to have great amounts of arrows (both regular and Bomb ones, if you can) because this fight will mainly take place from afar. 1st phase: The Scourge is painfully famous for constantly warping and staying high in the air to stay out of reach and be able to fire at you more easily. So this fight will almost exclusively be a bow one. When the boss is firing at you, whatever the attack is, remember to use the scenery to protect yourself. Once the Windblight is done attacking you, you have a shooting occasion, so use it well and use your bow. If you're really stingy with your arrows, you can also use the Master Sword to fire beams at it when your life bar is full. Aim in priority at its eye and use some Bomb Arrows if you have some, to boost your damages and stun it more easily. Also remember to use the updrafts to perform some slow-motion air attacks with your bow. When you manage to send it down or when it warps near the ground, dash and hit it restlessly with a melee weapon. After 50% of inflicted damage, the second phase begins. 2nd phase: Nothing scary regarding the attack power is awaiting you during this second phase. However, the Scourge's attacks will become way more unpredictable and will be able to hit you "in a dead spot" as Revali is telling you. As a matter of fact, the boss is summoning four flying objects that it uses to reflect its laser beams to hit you in your back and from various places at a time! It can also use it to throw a very quick windball at you. But don't panic, you can destroy these reflecting UFOs with your arrows. Also be more careful with its tornadoes because it can now send two at you at the same time. To defeat it, use the same methods as during the first phase, but be more careful when it's attacking you. Look for a shooting opening, aim right at its eye and go hit it in close combat when it's down. You should defeat it without any problem. Description: This time, the boss is a way smaller warrior, but still wearing this one-eye mask. It is wielding a small sword which is reminiscent of a hook as well as a shield to protect itself. But who says way smaller also says way faster, and for a very good reason: we have here no more and no less than the game's hardest boss, that defeated Urbosa in no time... Now it's up to you to retaliate! Its attacks: This Scourge is capable of the nastier tricks the developers thought for us. As it is far from you, it can dash to deliver you a lightning-fast blow. It is also able to cast magic and send electric projectiles at you that can bounce off against the walls, the ground and the ceiling. Then, the boss will add an electric effect on its sword, so be careful with your equipment! It will also generate metallic pillars next to you then use them in an attempt to zap you. 1st phase: Immediately take your guard because this Scourge won't pull any punches, and this right from the start. Start by looking carefully at its sword attacks' timing and try to place backflips or parries correctly to counterattack straightaway. Do not even try to use the bow, this boss is way too fast for this, your life bar would remember it. Stick to dodging its electric projectiles. If you have the enhanced Stasis Rune (check the Upgrade page), you can also try to freeze the boss for a moment to then attack it, it turns out to be rather effective. But take your guard again with your shield right after this. After 50% of damages dealt, the second phase begins. 2nd phase: Here we're not kidding anymore. The boss surrounds its sword with thunder and takes off out of reach. It will then generate metal pillars that it will send next to you before casting thunder at it to try to hit you. So use the Magnesis Rune to grab one of those pillars and place it next to the Scourge. The boss will then zap itself. But now that it understood what you're up to, it will attack again like during the first phase. So use the same methods to hit it and you will defeat it. If it touches you with its electric sword, you may loose your equipment because of the elemental effect. So be quick to pick it up and take your guard again. Tip: During the second phase, do NOT use a metal shield to parry! The boss having added an electric effect on its sword, only the wooden shields or the dodges will allow you to counterattack. Description: And here we are! It's time to settle things with the one responsible for all of Hyrule's troubles! 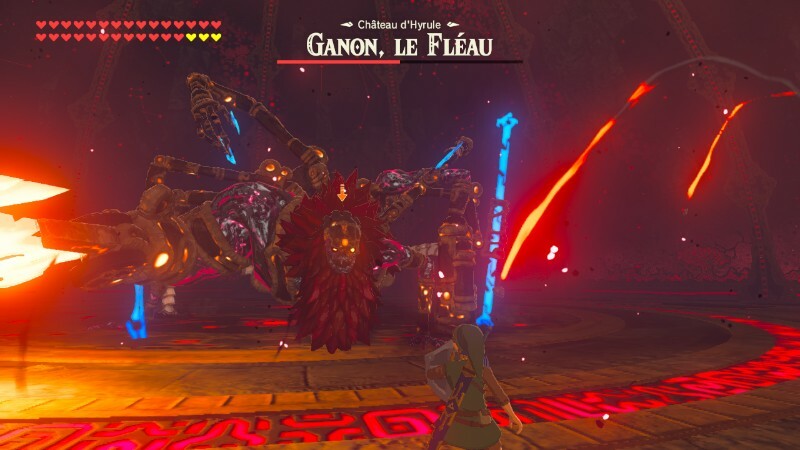 Ganon's first form is an enormous spider that would be the result of an inexpected crossing between Ganon himself and the Sheikah technology. It has ten legs. Four of them are used to walk, the six remaining ones wield various weapons. On its right side, one of them has a small sword, another is actually a clawed hand and the third one carries Fireblight's enormous sword. On its left side, one holds Waterblight's spear, another is wielding a small pair of laser scissors and the last one uses Windblight's cannon. Its attacks: This boss sports an impressive panel of attacks. It can use its little sword, its scissors or its claw to deal you a little blow when you're next to it. It wields Fireblight's enormous sword as violently as its first owner, by attacking you vertically as well as from the side and by leaving trails of fire behind it. It can also throw you Waterblight's weapon when it hangs from the wall as well as attacking you with Windblight's cannon, using its laser beams as well as its tornadoes or its lightning speed windballs. It can also use Thunderblight's attack which consisted in throwing metal pillars next to you then zapping them with thunder. It can also use Fireblight's deadly fireball and it can, when it falls back down or when you get too close to it, create a shockwave around it to send you away. Finally, and that's certainly the worst, it can fire Guardians' laser beams thanks to Windblight's cannon... During phase two, its body will be engulfed in flames, but its attacks will remain the same. 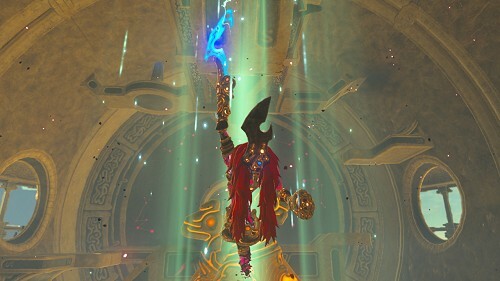 To defeat it: To defeat this demon, it's indeed best to be equipped with the Master Sword and, if you can, with the Hylian Shield. Of course, the four Champions' powers can also be a big help. Also remember to take lots of good meals and/or elixirs to help you during the fight. However, it's possible to defeat it, even if you don't own the Master Sword or if you didn't clear any dungeon. But do note that having completed the four dungeons takes off 50% of the boss' life bar from the very start thanks to the Champions' intervention. 1st phase: You have once again to look at its moves and dodge the attacks the same way you did against the game's previous bosses. Perform some perfect dodges and parries as soon as you can to be able to retaliate and thus deal a lot of damage. The previous bosses' own attacks are to be dodged at whatever cost, because they're rather powerful. Be careful with the fire sword attacks, because if you don't manage to dodge and counterattack straight away, it leaves trails of fire behind that hinder your moves but which also generate updrafts that you can use to perform air attacks with the bow. Don't forget that you can use, if you have it, Revali's Gale to take off in the air and counterattack with some well-placed arrows (Bomb ones, Shock ones or Ancient ones, if you can). When Ganon feels too endangered, it will crawl on the walls, but it eventually stops to perform one of the following attacks: throwing its spear, firing with its cannon (laser beams or tornadoes or ultra-fast windballs), Thunderblight's electrified metal pillars, the deadly fireball or a Guardian's shoot. To dodge all of this, the simplest way remains to sprint but you can, if you feel brave enough, try to repel the Guardian's shoots with your shield, which is why it's good to own the Hylian Shield, perfect for this task thanks to its incredible strenght. 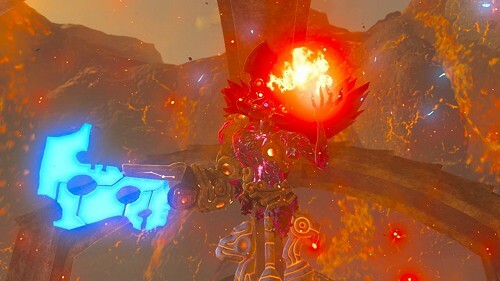 The Scourge of Vah Rudania's fireball can be stopped with an Ice Arrow. 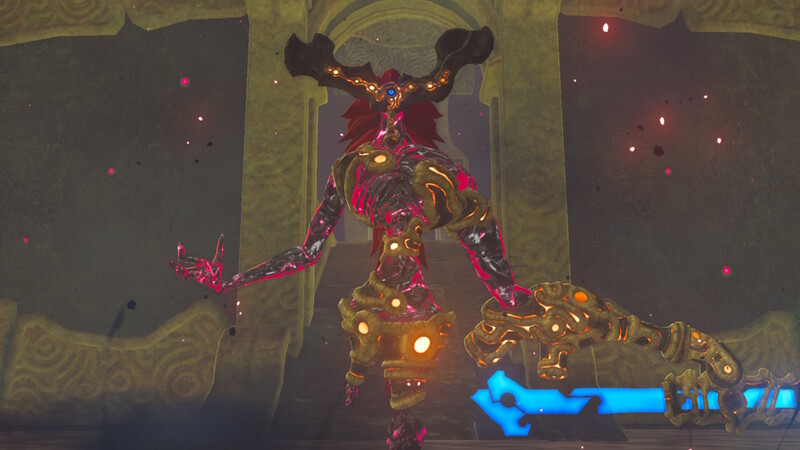 If you have Urbosa's Fury at your disposal, you'd better use it when Ganon hangs from the walls because it will make it fall down, which will allow you to take it in close combat. 2nd phase: The boss will protect itself with a shield putting its body ablaze and protecting it from any attack. Don't waste your Ancient Arrows, there will only be two ways to hit it. You'll have to perform perfect dodges and parries to then be able to counterattack when its shield will dissapear for a moment. 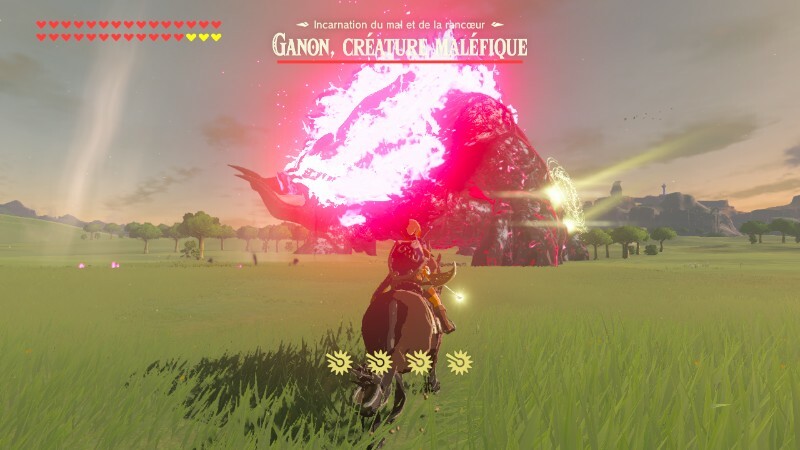 The second solution is simply to use Urbosa's Fury, if you have it, to put it down and neutralize its protection for a few seconds. However, you'd better use counterattacks when Ganon is facing you and Urbosa's power when it's climbing the walls, to easily make it fall down and then hit it. Description: Finally, here it is! Ganon's ultimate form, the incarnation of Malice which caused havoc and desolation on Hyrule for the past hundread years! It is the famous evil beast coming right from A Link to the Past, with its boar-like appearance with the flaming mane and the terrifying roar. Be brave, be courageous and get ready for... an incredibly easy fight? Its attacks: To be honest, it only has one consisting in firing an enormous red beam at you from its mouth. And to get hit by it, you really have to get out of your way, because it will miss you each time. Apart from this, its body itself will inflict damage if you touch it. To defeat it: Nothing easier. Get on your horse, grab the Bow of Light that Zelda gives you, and gallop around it. Zelda talks to you and tells you she will weaken it so you will be able to touch it. And as a matter of fact, your attacks are useless on it. When Zelda makes the light marks appear on Ganon's body, shoot a Light Arrow in the middle of the Triforce symbol on each mark to cause damage. After some time, Zelda will warn you that you have to destroy Ganon's core. The boss' forehead will then open for you to see a disgusting pulp in the middle of which you'll see some rather ugly-looking eyes. Shoot a Light Arrow in the core of this pit of darkness, and you will defeat Dark Beast Ganon! Thanks to Naelink for taking part in this!